Wandering through the stores this festive time of year often makes me wonder — why is there so much kitsch on sale costing so much? Big plastic inflatable Santas, bright blinking outdoor strobe lights, and a myriad of other Christmas decorations that will see the landfill once the big day is done. 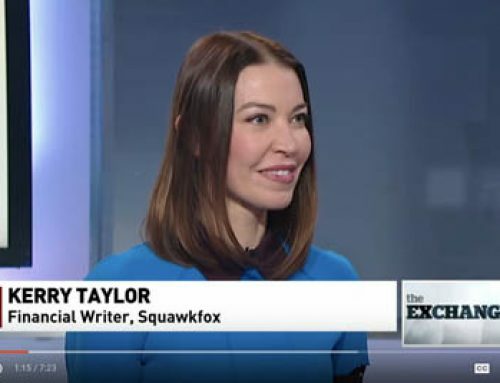 Yeah, you know the stuff I’m squawking about. Your holiday dinner table isn’t immune from the marketing craziness either. There must be a million different ways to spend money on a dang holiday centerpiece. Then there are Christmas table linens, nativity napkin rings, holiday-themed dinnerware, quilted Christmas table runners, table top Christmas trees, poinsettia placemats, Christmas candlesticks, snowflake dining chair covers, and even reindeer stemware. It’s a lot of stuff to store in the basement for just one day’s use, and you don’t need any of it. I want to prove that you don’t need to deck the halls with boughs of money to give your home a holiday feel. So I set myself a fun little frugal challenge after spying the seasonal decorating holiday blitz in stores right now. 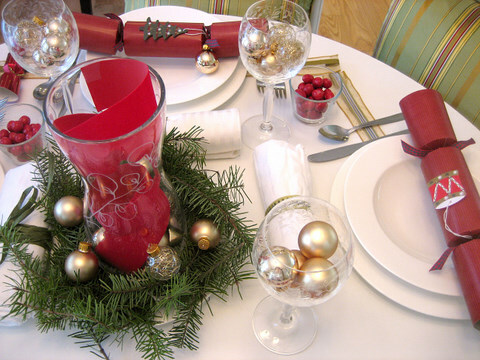 Holiday Decorating Challenge: Can you decorate your table for Christmas dinner using only the stuff in your house today? Must use everyday items found around the home. Can use holiday items from last year. Can look outside for decorating ideas. Can make a shopping list for needed items. Sounds hard, right? But it’s not. To make the most of this challenge, I used a few classic decorating tips I’ve tricked out over the years. These could work for your budget too. 1. Start Neutral: Take a neutral dining room, add in a few basic furnishings (white, beige, or wooden tables and chairs), and take this room to holiday levels by layering in bright accents, textured accessories, and various textiles from around your home. 2. 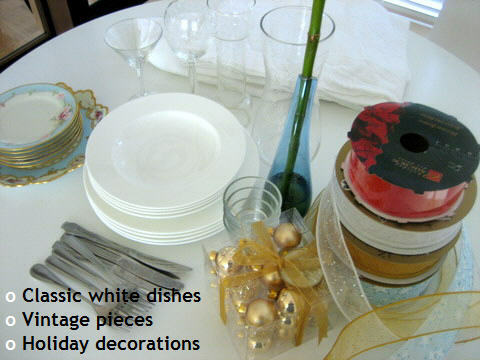 Classic White Dishes: Invest in quality white dinnerware and elevate these everyday basic whites for the holiday. 3. Skip the Silverware: Use everyday flatware to save money, storage space, and endless hours spent polishing silver. 4. 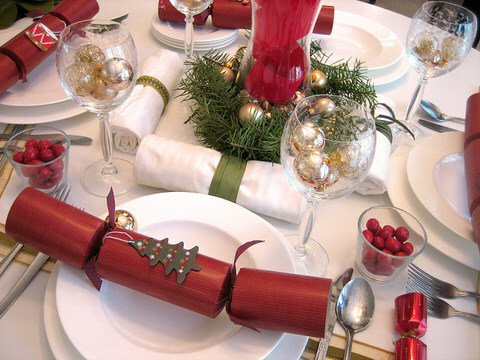 Use Mismatched Items: Set your table with some warmth and charm by using mismatched knives, forks, and dinner plates. One-of-a-kind pieces are conversation starters which make your table look original, not store-bought. 5. Embrace Vintage Pieces: If you have Grandma’s wedding china or an assortment of flea market finds, go ahead and embrace these vintage pieces. A pop of color from a vintage plate can make a stunning and inexpensive centerpiece. 6. Add Silver and Gold: Silver and gold touches from ribbons add shimmer and sparkle to your holiday table for little cash. 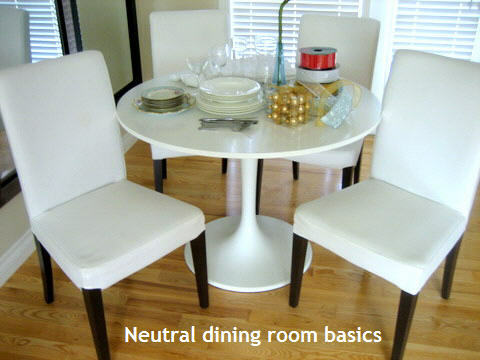 Metallic shades can heighten drama and turn basic whites into a glamorous statement. 7. Go Outside: Grab some greenery from the great outdoors (pine cones, evergreen branches, flowers) and turn them into Christmas decorations with a little wire and ribbon. Easy to make Christmas decorations from nature can bring a fresh, organic vibe to your dinner table. 8. 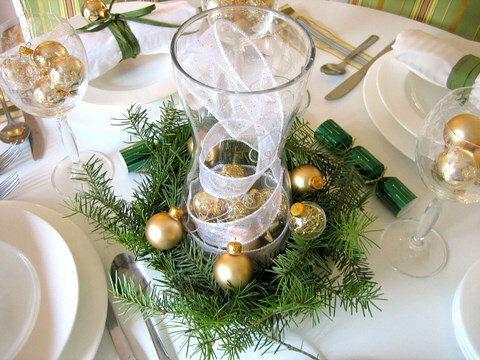 Use Ornaments: Add some sparkle to your table with a few well-chosen ornaments. Colorful baubles and glass Christmas tree decorations can have a place at your table. Pick a single color to add class and a touch of drama. 9. Use Pillows and Throws: Check your linen closet for forgotten sofa pillows and seasonal blankets or throws. It’s easy to add some holiday cheer by switching out your everyday style for a few warm blankets and plush pillows to get that holiday glow. 10. 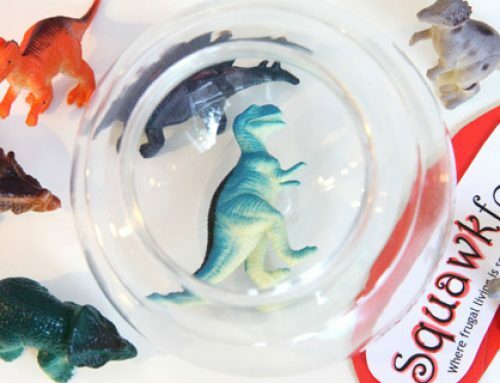 Skip the Kitsch: Save your money by not spending it on cheap plastic Santa stuff. Opting for classic, quality holiday pieces over plastic kitsch will save you money today and stand the test of time. Here’s how I used these tips and tricks to create three very different holiday table settings for that special dinner. Step One: Look around your home. Don’t look past your everyday home furnishings when decorating for the holidays. A simple white table with slip-covered white chairs can be dressed up for any big event. Ikea shoppers will instantly recognize my set of Henriksdal dining room chairs (bought used on Craigslist) and my Ikea Docksta tulip table. I would love a real Saarinen table one day (sigh), but for now my tulip table copy fits my budget. Once you’ve chosen your table and chairs, it’s time to open your kitchen cabinets, peek into the pantry, and rummage through the basement for your holiday baubles and Christmas decorations. To the skeptic’s eye my holiday cheer may look a little depressed. White plates and a white table cloth? But don’t despair, simple classic pieces like white dishes, clear glass vases, and mismatched flatware can be used daily and then glammed up for big events using shimmering ornaments, festive ribbons, and even Grandma’s table china. Now that you’ve got your holiday goods, it’s time to turn them into something special. Step Two: Pick a nontraditional color. Sticking to a strict color palette is not only an inexpensive way to decorate, but a single color applied to your dining room table can look clean, classy, and very elegant when done right. And you don’t need to stick to classic Christmas greens, reds, and poinsettia flowers either. I dare you to look past these so-called traditional holiday trappings by exploring your home for colorful everyday pieces that can be spun into a festive feel. For example, if you found plates, pillows, placemats, or ribbons boasting a particular hue of yellow, shade of blue, or shock of pink, then go ahead and use these everyday items for the holiday. Not only will you save money and space by reusing your stuff, but you’ll enjoy the evening more by not fretting about getting knife marks on expensive designer dishes. My home is filled with the color blue. It’s a comprise I made with Carl years ago when we combined our belongings. He brought blue towels, blue pillows, and even a dang blue sofa into our relationship. The only blue things I own are my Grandmother’s tea party plates. Nothing says Christmas like a set of blue Grandma plates, right? Well think again. 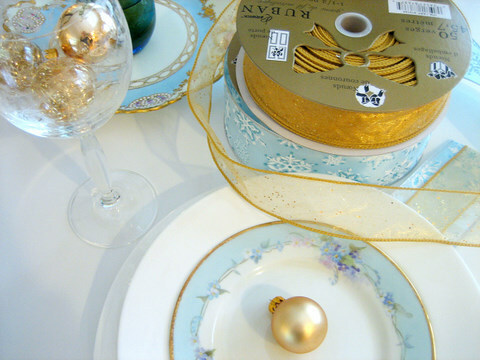 Inspired by these gold-flecked vintage dishes, I added some holiday sparkle with gold ornaments, matching blue ribbon, and a highlight of golden fabric. Tip: It’s super easy to go overboard and get tacky with golden hits of glitz. 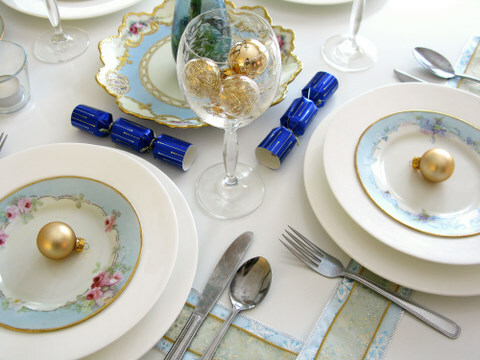 If you’re going for gold, keep everything else on your table (dishes, placemats, and centerpieces) clean and simple to avoid a kitschy Christmas. 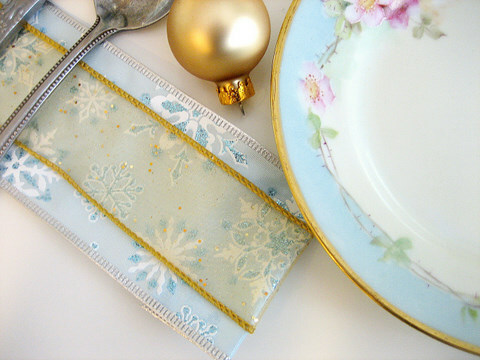 I don’t own placemats or table runners, so I used simple strips of ribbon under classic white plates to add a hint of blue and to ground each setting. The table centerpiece is an inexpensive blue vase from Ikea filled with a bamboo shoot, and set atop the most ornate of my Grandmother’s plates. This is an inexpensive centerpiece idea since everything is reused from around my home. To give the white Ikea chairs a little blue sparkle, I grabbed my sofa pillows and placed them at the dinner table. If you’ve been reading this blog for a while, you may recall my living room canvas wall art project mimics the pattern from these pillows. In keeping with the challenge, the only store-bought holiday decorations are a few leftover blue Christmas crackers, some small gold ornaments, and several white tea candles. If I went shopping: A little bit of blue goes a long way, so I’d take a pass on more blue home decor and opt for a few tall white candles to give this table setting additional height and fullness. I’d add a few fresh flowers to the mix too. Not convinced by a nontraditional color palette? Check out designer Kelly Wearstler’s book Modern Glamour: The Art of Unexpected Style for some single color inspiration. Stunning book. Step Three: Go green, go outside. Don’t be afraid to go on a nature hike to find fresh inspiration for your holiday table. During the season, many big stores charge a small fortune for evergreen wreaths, pine cone centerpieces, and lush decorations. By going outside to find these green elements for free, you’ll save some cash while adding organics to enhance the festivities. Sticking with a single color theme again — this time green — I sent Carl outside to find some green sprigs and evergreen twigs. Add a little bit of fishing line to hold the greenery together and you’ve got an instant table wreath. Place on a white plate, stick a glass vase in the center, and scatter a few ornaments into the mix and you have another inexpensive table centerpiece to dine around. Since I don’t have any candles or flowers in my home, I filled the vase with shimmery white ribbon and highly textured ornaments to create some sparkle when the lights are dimmed and the tea lights are lit. I searched high and low for classic and elegant placemats, but there were none to be found in my home. So I used my ribbon trick again to ground simple white dishes on top of an everyday white tablecloth. 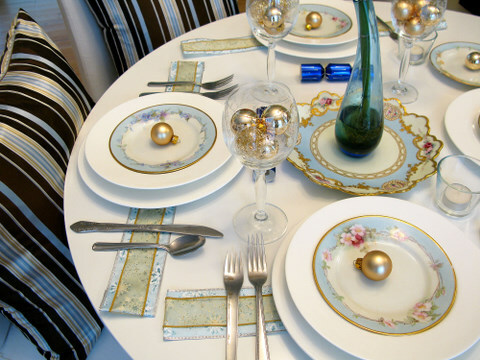 By matching gold fabric with the flecks of gold in the ornaments, I’ve reused many of the elements from the previous blue dinner table theme. 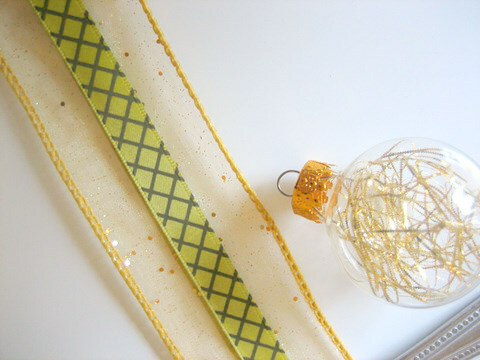 To bring more green into this setting, I glued a piece of green ribbon to the gold fabric. Kermit the Frog said “It’s not easy being green” (YouTube video)– but I think it is. 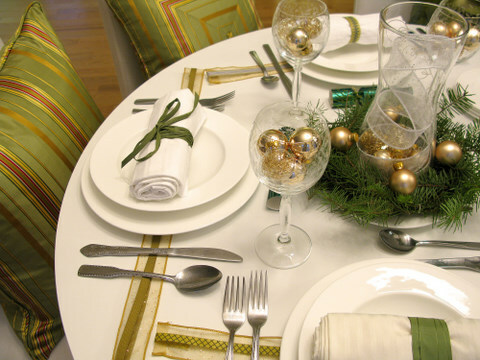 By wrapping white cloth napkins in green ribbon (I don’t own napkin rings), adding a few sprigs of evergreen greenery to the centerpiece, using last year’s green Christmas crackers, and creating sparkle with golden ornaments, this green theme is not only frugal, it’s pretty darn festive. Oh, and those green and golden pillows were pinched from my linen cabinet — I forgot I had them. If I went shopping: I’d buy tall white candles and a few white flowers for the centerpiece. Step Four: Add layers of color and texture. A single color themed holiday table can be tasteful and full of drama. But for maximum impact, why not layer in another shade to seal the holiday deal? 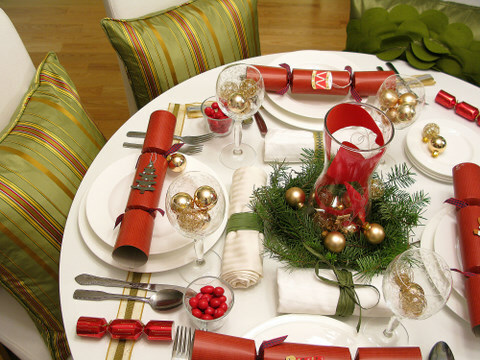 Using everything from the green theme, I included a few hits of red to help convey the look of a traditional Christmas dinner party, without the cost. I added a few homemade Christmas crackers (I’ll show you how to make these in a later post), filled my tea light candle holders with red candy (I would prefer red candles), and filled the white glass vase with a red ribbon. As you can see, a little bit of red goes a very long way to steal the show. I love how the red Christmas crackers and candies draw the eye to the barely-there red stripes in the green pillows. Notice how my green dining chair pillows don’t match? The variety of colors and textures in the pillows brings some warmth and magic to this table setting. If I went shopping: I’d replace the red ribbon in the centerpiece with red vivid flowers. I’d also eat the red candy and put some red candles in their places. The gold ornaments in the wine glasses must go and make way for some sumptuous red wine. Step Five: Make a holiday shopping list. Knowing what you already have for this holiday season makes it a lot easier to know what you need to buy. And once you identify your holiday decoration needs — for me that’s candles, placemats, and flowers — it’s easier to make a shopping list and stick with it. Go ahead and use my Holiday Expense Tracking Spreadsheet to tally your costs, needs, and holiday purchases. My Gift Giving Worksheet will also keep you on Santa’s good list while balancing your budget. I must admit, my Holiday Decorating Challenge took a lot of thought and effort to get from my linen closet to my dining room table. So I hope you feel inspired to save some money on your own Christmas table decorations by looking around and attempting to make use of your existing home decor and holiday decorations. With the right attitude, it’s easy to stick to a budget and still dine in style this holiday season. 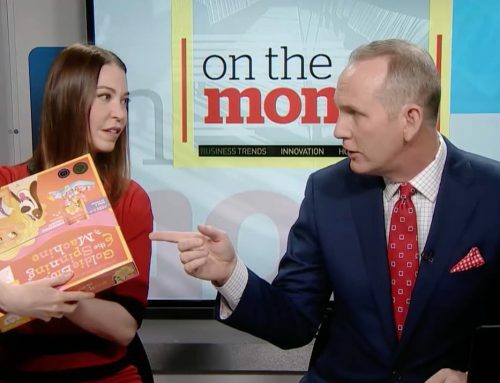 Gift Ideas: Books about Money, Honey! 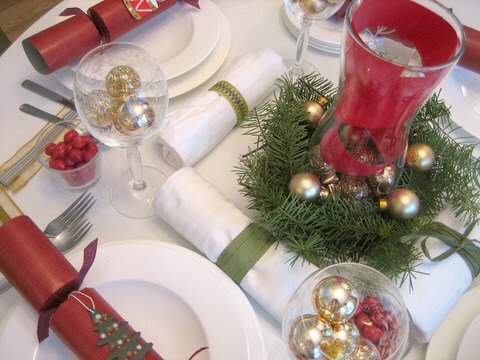 Squawkback: What’s your frugal holiday table decorating tip? Got any ideas for inexpensive centerpieces? Nothing new to our family in your post. 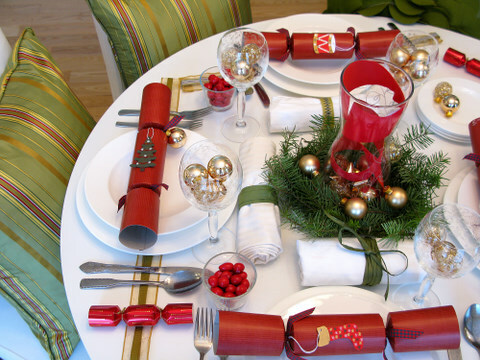 This is the way we have been decorating our homes and tables for festive occasions for the past 4 generations. We have always been anti-plastic and gimmick free. I am appalled at the popularity of those huge plastic blow up santas and such. They make me cringe and I think there should be a huge environmental fee tacked onto those horrid things. I am suprised that you got sucked into buying holiday crackers. Talk about spending money for junk that ends up in the landfills. I prefer to spend that money on pretty festive paper napkins and place those in the middle of the plate. Plus, they are compostable. @Diana Great points! I mentioned in the post that I do make my own holiday crackers. I completely agree with your post. I think the point about buying quality basics whenever possible is a good one. I have lovely plain crockery, a reduced by 75% set of flat ware, 12 ” white napkins and plain silver napkin rings, which I have collected over the years. They are good every day and so, so simple to dress up for any occassion. I would also add, that once you have your list, consider thrift/goodwill stores. These places can be a treasure trove of crockery, flatward and glassware, as well as pre loved xmas pieces. You might, if you’re lucky find some plates as beautiful as your blue ones! Single use seasonal decorations are an abomination in this day and age. Very nice! Had a moment of deja vu seeing your grandmother’s plates! I think mine had some very similar ones! Enjoy your holidays! A very nice job on the settings, but when I look at that picture, the table is screaming at me: “I want a tablecloth!” Any frugal ideas about those? @John I tend to use just a white table cloth. 🙂 I bought my plain white table cloth for around $10. You did an amazing job! The photos of the finished product look great. It looks like you did everything so effortlessly. I am glad to see you make comment about the thought and effort involved to make it a reality. Now if we can just figure a way to keep little hands away from all the pretty stuff until dinner ;)-(Our kids are 3, 2 and 5 months). Brilliant article – I SO try not to get all “bah humbug” at Christmas but when I see the shops getting their decorations up earlier each year and encouraging us to spend more money, I just want to dig my feet in and celebrate with simplicity. Love your ideas! Hi! This is such a great article and I am sure a lot of money saving enthusiasts are going to benefit from this. Keep it up! part of our family bonding is decorating the house for christmas. everybody has his own share of decorating. one rule is to decorate more with less budget. so we usually do personalize and recycled stuffs. brings out the creativity in each and every one. This was a fantastic post. Thank you so much for putting so much work into this offering. We always host Christmas, and this will help. I just posted a small rant on my site about holidays, cargo, family. Love to have opinions on it if any would like to offer them? Thanks. Absolutely gorgeous! Decorating using your imagination with what you have on hand is so much more personal than going out and buying what the stores decide is in fashion this season.You prove that you don’t have to spend money to make life beautiful. Besides, cherished keepsakes are so much more loved. I always enjoy your articles but this one inspired me so much that I hope you don’t mind mention on my little blog. My step #1 – ignore the entire holiday and hide from the insanity for the month of December. I save lots of money by not buying anything, and avoiding restaurants for the whole month. For me the year is January through November, 30-ish days of hellish limbo where I avoid stores and public places, and then the joy that is the beginning of a new year. And I’m not alone. I have friend who escape for the month of December every year to go traveling far from North America, just to avoid the insanity (and enjoy the travel, of course). Very nice! I love using what I already have in decorating– going out and buying something different for every holiday is just not for me. Thanks for your great ideas, especially the ones with ribbon on the napkins and under the plates! Great article. I have established the tradition of decorating and use family ornaments and decorations collected over the years including a Santa (some 12 inches tall) that was given to my father by his grandfather Christmas Day, 1920. I agree with your suggestion of using mismatched pieces. Personally, I don’t think the dinner will taste any better if served on a $10 plate as opposed to a cute plate found at Value Village for $3. Or at a flea market. I never go with red and green, it simply does not appeal to me. Who says Christmas cannot be celebrated in, say, orange and purple? Go for whatever colour floats your boat. Again, just a personal comment – I find that you have way too much on the table (for its smallish size). There is hardly any empty space and also the centrepiece is way too big (again, IMHO). I have an adorable teacup (a bit larger size) with a matching saucer and it is the ideal centrepiece for my small rectangular dining table. It looks equally festive and it does not block the view. It can filled with whatever the green foam is (that soaks up water and you just stick your flower stems into it). A tablecloth does not always have to be tablecloth. You can easily reinvent, say, a curtain, or even a bed sheet. There is no limit. But it requires some planning ahead. I often go to Value Village just to check what’s in there. So you may find something that can be transformed into a Christmas tablecloth in May. (Unless it would bother you that your tablecloth had a previous life, I am immune to that). I LOVE making a beautiful table and I must say your blue and gold table is unexpected but beautiful for Chistmas. Absolutely Beautiful! Awesome! I made 3D snowflakes and hung them up for decorations. My Christmas table cloth was inherited. My Christmas bouquet came from $ store picks and this will be the 3rd year I bring them out. I have two. I put them in vases I already own and change them seasonally. The last couple years I’ve put Christmas cards on the tree and with the lights it’s simple but pretty. My best Christmases were when I made gifts and decorations. That is so beautiful and elegant! I love the color combination, they made that christmas table decorations really spectacular. Thanks for sharing! I see some of these posts go back to 2010, but I’d love to tell Diana off. Pretending to care abut the environment in her snob tone. The guy who disappears during December must have deep justifiable reasons. We’re all mostly depressed during this season, but can’t escape. Many of us cover it up with elaborate festivity, decorations and, yes, even pretentiousness, superior Diana.